The newfangled enclosed mall to beat them all in 1974 - a huge amount of concrete and steel that didn't last 30 years. What's every to become of the "Chuck E Cheese" side of this area. I had high hopes when they hung the mock up designs for stores like Poppies, "purchased" Crenshaw Law office, and placed a chain link fence around the area. The fence is now gone, Crenshaw seems here to stay and the cinder block piles I think move during the night. Any ideas or are we doomed to urban blight for many years to come? 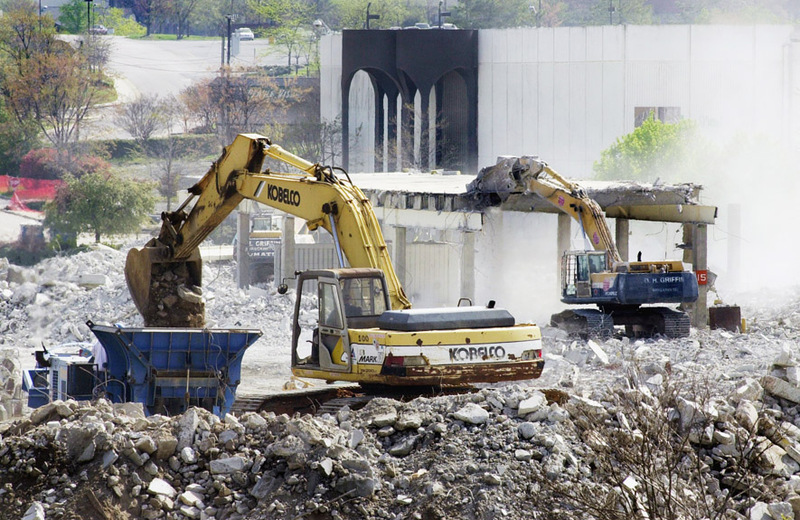 What bothered me the most about the demolition of South Square was the loss of the covered parking deck - an actual place to park in the shade during the summer. That would have worked fine for the stores that they have there. It's rather sad to drive around the South Square area now. It seems so vacant and run down compared to 10 years ago when it was a hub of activity. It seems as if Southpoint is pretty much dominating the Durham retail market. I remember hearing rumors that once Southpoint wasd approved South Square stopped renewing leases to speed up the mall emptying out. I was always suprised the developer of the "new South Square" didn't try to include Dillards in the redevelopment plans prior to the store closing. I'd love to have a nickel for every hour I spent in that mall. I remember being very small and going to the grand opening with my mom and grandmother. I knew at least one employee in almost every store. The Record Bar downstairs, Camelot Music upstairs. The Gold Mine is where all the boys hung out. The Hope Valley Baptist youth group practically ran ChicFilA. Which was cool b/c I knew them all and could get free food. Brooks, DA Kellys, Hofmeimers shoes. Trying on prom dresses at Montaldos, knowing we'd never afford one. Working at the Gap. The tiny elderly lady who worked the baby section at Belks. York Steak House, The Piccadilly, we ate lunch there one of its last days. Cards N Such. World Bazaar, Charms of the Orient. I took some outside pics just before they tore it down. And I think I have a picture of my friend working at Athletic Attic. And our Jordan yearbook sold an add to The Woods, with a picture of the staff standing in front of the store. Actually, now that I think about it, the 1988 Talon has a section of students at work, and most were at South Square. Several pictures of the students, but not too much background of the stores. I remember the heavily varnished railings and those slatted wood benches. I remember parking at the food court most times and nearly busting my tail on the slick brick walkway whenever it rained. (sniff) good times . . .
@WCS - contrary to Anonymous, I do think the second photo is South Square -- I vaguely remember that semi-circular candy counter under the escalator at the north end of the central fountain area. Wow, I remember going to his mall a lot during the mid to late 90's. If only there were some other pictures of inside.. The first one looks like it very well could be, but the second one is definitely not. There was never a Zales at South Square, and the whole decor desn't look right at all. What a coincidence to see this posted! Just last night I was looking a group of pictures taken in 1990 at various malls across the country. I think two pictures are of South Square! http://www.howtobearetronaut.com/wp-content/uploads/2011/03/Mall-41-520x... http://www.howtobearetronaut.com/wp-content/uploads/2011/03/Mall-67.jpeg What do you think? Looks just like it to me! When I was born, my parents lived on Pickett Rd., and remember when the land that became South Square was rolling countryside. Of course, after it opened, we did a lot of our shopping with South Square. My main memories were of riding the escalator and throwing pennies in the fountains. South Square did have very nice indoor fountains. For a few years after we moved to Asheville, my grandmother and great aunt continued to live at the Valley Terrace Apartments on Chapel Hill Rd. One of their favorite lunches was to go to the Picadilly Cafeteria on the upper side of the mall. Clyde Edgerton's Lunch at the Piccadilly pretty clearly is about that location, even though it's supposedly set in a fictitious town. (His aunt went to church with my grandmother and great aunt at Pilgrim UCC and were friends, and we're pretty sure that there's a joke in the first chapter that's a quote from my great aunt Dilly.) On the one hand, so much more could have been done with the South Square site. On the other hand, at the time that the current bigboxopolooza went in, I rationalized it this way -- South Square lasted a scant 20 years before getting torn down. It sat vacant for a couple of years before something new went in. What are the chances that shopping center is going to last much more than 20 years? In 15 years or so, we'll get another shot at doing that space better, a design and an architecture that's worth keeping around. I'm with John M. on this. I don't much miss South Square, as the real loss came when it went in, not when it went down. I miss South Square.' First I missed the stores that once were in my little home town of Hillsboro. Then I missed the stores in downtown Durham. Now I miss South Square. Things seem to change and move farther away. Get used to it. When South Square is a meadow again no one will be around to appreciate it. to John Martin . . . You say that you prefer Southpoint to South Square. Interesting, since the way you feel about what South Square did to the landscape is exactly how I feel about Southpoint. I grew up near there. My school bus rode right down Fayetteville Rd. There were small farmhouses, beautiful rolling pastures, huge 100+ year-old oak trees. And now it's all gone, and the sprawl is spreading like a cancer, just as the powersthatbe promised they wouldn't allow it to do. I have yet to set foot in that horrible place. It's a matter of principle. I can me and my friends would spent hours in the game room mainly playing the football games back in the late 70's thru the early 80's. It became so popular that they used to have leagues. After that I would go to Schano's pizza and the 2 slice special. My-my-my.....those were the days. I'm with the other dude, I miss the land that was where SouthPoint is more than SS mall. I had friends that lived closer to I-40/751/fville/barbee and when I got my drivers license we loved cruising the dirt roads crisscrossing through those woods. I wanted to live there when I "grew up" but then they tore down all the forest to make Southpoint area when I went to college.. I spent a lot of time and money at Gold Mine / Tilt in SS mall. That arcade was my babysitter for several summers. I could make 10 dollars last all day long in that mall. OK, I've got to chime in. I bear no love for the lost South Square. It was loud and bright and busy and brash and far less tasteful than the comparatively calm (yet at that time thriving) Northgate. It had more stores than Northgate, yet few that sold anything I seemed to need. As a result, I went to Northgate far more often (and would still, if Northgate had any stores left...) That said, I did take my young kids to South Square to get pictures with Santa & the Easter Bunny. So strange that -- with my kids now barely in college -- South Square is but a whiff of memory! But it was, architecturally, hideous, both inside and out. I had to steel myself every time I went in. Even the big box stores that replaced it have better lines. And I find myself going to Target far more than I ever went to South Square. So I don't mourn its passing much. And the area may yet recover: I LOVE the new Asian market nearby, next to Toys R Us, where Circuit City used to be. This area may yet turn into a real town. Some day, it may even offer something more to pedestrians than a couple of brick walkways through the Sams Club/PetSmart/Target parking lot...! A few years after South Square was built came the end to Mike Rubish's Golf City. Early 80's maybe. Driving range, par 3, miniature golf and a stocked pro shop. Mike was one of Durham and Chapel Hills very interesting characters. If I remember correctly he played football at UNC and possibly the NFL. Why are all the cool old 70s malls the ones to be remodeled with ugly stucco or closed and demolished... especially here in the south!? SouthPark, Carolina Circle, Crabtree to an extent... I'm glad we have a few vestiges of that era left such as Dillard's University Mall. > The tiny elderly lady who worked the baby section at Belks. I worked in the baby section part-time in high school. I remember her too, but I can't remember her name. She was a sweet old lady. Man, I miss that place... even bought our wedding bands there at Forrest Jewelers. Gary, Spinnakers!!! Not that you don't already have the most Durham-cred of any person I know but remembering Spinnakers just took you to a whole new level. Wow, impressive is all I can say. Btw, this is an incredible sight and I love not only reading about Durham's past but also getting updates on where we are going as a community. I really can't say how thankful I am to you for doing this. Great, great sight. PS- Ever heard of Batton's Quickshop in the 80's next to Jimmy's Grill on Guess Rd? It was a little hole in the wall but it had local fame for great biscuits and chuckwagons when I was growing up. I was strongly opposed to the construction of Southpoint, in part because of concern for the environment, but even more because I thought it would hinder efforts to move retail shopping back downtown. I thought it added insult to injury that they fashioned Southpoint to look like fake Durham. But as the new Downtown Durham has begun to really take shape, I'm actually kind of glad that the big chain shops -- the Gap, Ambercrombie & Fitch, etc. -- are all located somewhere other than downtown. The only chain that I can think of in Downtown Durham is the McDonalds, and hopefully that will go at some point. And I do end up shopping at Southpoint, so in the end, I'm not as disturbed by it as I thought I would be. I have so many, many memories of going to the old South Square. When I close my eyes and picture walking around inside, it is tough for me to even reconcile my memories with the reality that it's not there anymore. It just felt so permanent. I didn't really have any love for the mall beyond the nostalgia of my youth. A mixed use solution to that space would certainly have been more interesting, but then again, who wants to live right by a highway? Incidentally, Jim, I do remember Blair House (a place I did go), and Blueberry Hill (a place I wanted to go, but couldn't -- too young). I remember driving to Chapel Hill as a pre-teen, and my mom telling me that at the rate they were going there would be no trees between Durham and Chapel Hill, and that it would all be bulldozed and turned into shopping centers. I didn't believe here at the time, but she sure was right. I remember when South Square was built also Northgate Mall. When I was in high school we hung out at Northgate every Friday and Sat. nite. but, when I was a kid South Square had a store called the World Bazaar(sp). My friend and I were at Mike Rubish's Golf Course (where Toys R Us is located) we were playing putt putt and decided to walk the golf course and found a bank bag at the pond. It was the zipper kind we opened it and it was full of checks to the World Bazaar. No cash just checks we called the police and met them at JC Penneys. The World Bazaar had been robbed and the robbers took the cash and threw the checks in the pond. Sad thing is my little brother got the reward, he told the owner he found the checks (the little s@$t) all was forgivin. South Square was just right for me. It was not too large for me to get around in. And it was large enough to have all the stores I needed. I liked the two levels with escalators on each end. We enjoyed dining in the cafeteria very much. When my daughter was in college she worked at the candy kiosk on the lower level. South Point is just too big and spread out for me to like. Parking there is terrible. Haven't been there much. Northgate too is spread out and not much there any more it seems. Sears is usually as far as I go. I remember Chick-Fil-A being behind South Square to itself. If it was ever inside I don't recall. To me South Square was more convenient, and had more of an intimate feeling. I still miss it. I remember those days well. I spent the bulk of my youth inside the Gold Mine which became Tilt Arcade. I learned how to drive a manual car, by playing the Atari Hard Drivin' which was replaced by Race Drivin' over the summers of 1994-1998. I even became employed at its rival, at Northgate Mall, the former Golden Nugget which became Cinnamonster, which gave way to Take Ten Arcade. I lived within a 40 minute walk of Northgate, which I traversed, to get to work. However, riding the DATA bus to South Square, well, it was like an event, and walking into the food court, and immediately seeing the Tilt Arcade on my left? The Subway to my far right, with the cute-as-hell Nubian girl, with those bright braces working there (hey, we went to the same high school, never did have the courage to ask her out)? Well, that was near magical, some days. I remember South Square mall with much fondness. My uncle Bill Boone, who owned London Marina, which eventually became Dashboard Stereo, was also my father, Butch Blanchard's boss. I spent a lot of time at London Marina as a kid watching my dad work on boats, and riding around the parking lot in the dune buggies that the fiberglass shop at London Marina built. I also remember Mike Rubish and his mini-golf course across the street. My late aunt Cathy Woods used to date Mike Rubish. He was a prominent character in the Durham area. The Unican Corp. which my uncle Bill owns is now located next to where Dashboard Stereo used to be. I used to walk down the hill behind that property as a kid to the mall to shop at Kaybee Toys. I also loved looking at the knives and cutlery at Remington Knives. Does anyone remember, or have any pictures of London Marina? I can't find any on the web. What great memories. 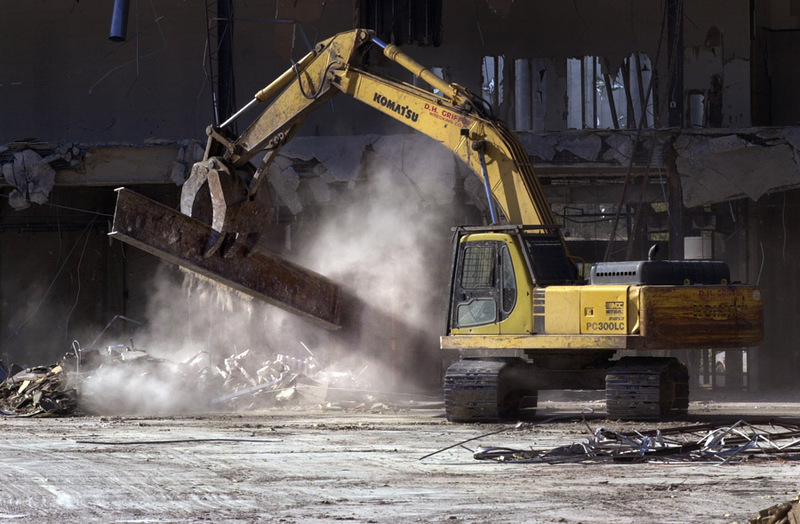 I hate that South Square was torn down after only 27 years in business. What a shame. Does anyone remember London Marina. It was right outside of South Square and later became Dashboard Stereo. If so, does anyone have any pictures of it? My father, Butch Blanchard worked there in the early 70's for my uncle Bill Boone who owned it. Bill still owns Unican which is in the same complex. I spent a lot of time there as a kid. My aunt Cathy Woods used to date Mike Rubish that owned the mini-golf and pro shop across the street where Toys r Us is now. I have a lot of great memories of that place. So much has changed since then. I remember London Marina! I remember going there as a little kid in the '60's with my parents to look at boats...and they were giving out little plastic speed boats to the young ones. I hadn't thought of that in 30+ years. Does anyone remember a small boutique at South Square called The Orchard? My uncle Bill Boone owned it, and my aunt and cousins worked there. I do wish someone could find pictures of the London Marina which was located outside South Square Mall. I spent a lot of time there as a child. They were masters of fiberglass, and used to repair Corvette bodies and they also built fiberglass bodied dune buggies. I remember riding around the parking lot in the dune buggies while sitting in my dads lap driving as best I could! I remember running into a dumpster one time! Good times! 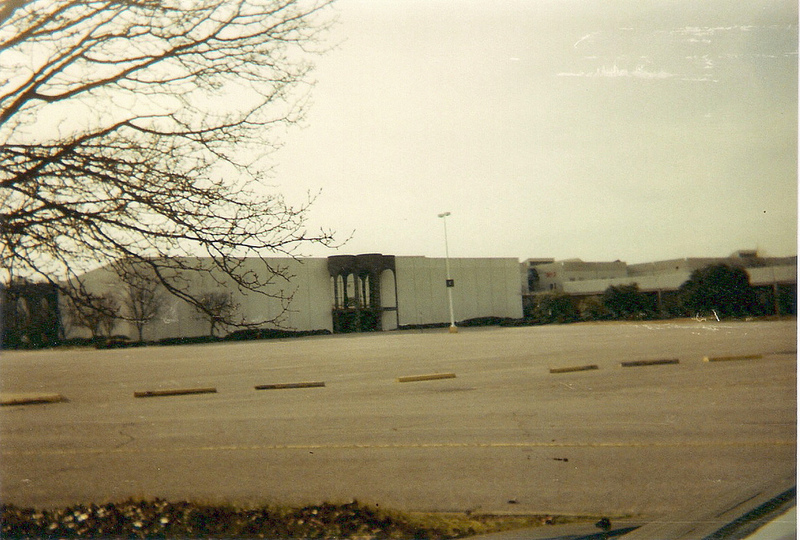 My parents still remember South Square Mall being built in the 1970s --from a meadow on the Chapel Hill Blvd.--We all saw it open in the summer of 1975. Most of us who went to Jordan High back in the 70s worked out there and certainly shopped there. It was in our school district, so we felt it was ours. Nationwide, that was the trend for shopping malls. An anchor store, (J. C. Penney and Belk-Leggett) at both ends of a rectangular two level mall with another anchor store, (originally Montgomery Ward) in the middle at what was known as center court. I have to admit the parking decks on the front and rear make it look hideous, but it was still Durham's largest mall. Tastes have changed in mall development...for the better! My parents are now in their eighties and they still remember South Square Mall being built "out of the dust". It served it's purpose for the time it was here. 27 years is not a long time, but Durham has "outgrown" a mall of that size. Durham is North Carolina's fourth largest city and I guess Streets at Southpoint is the norm now. I am glad I was a Jordan High School student at that time. South Square Mall was just the right size for me. I don't think my parents go out to Southpoint Mall much.They can tell you when there was nothing but Durham County's last traces of small farm property on Fayetteville Road, where the mall is now. Yeah Durham grew up ....and out! It's funny now that retail and life is returning to downtown Durham. We saw Sears and Belk-Leggett leave, but downtown has some nice shops and restaurants now. 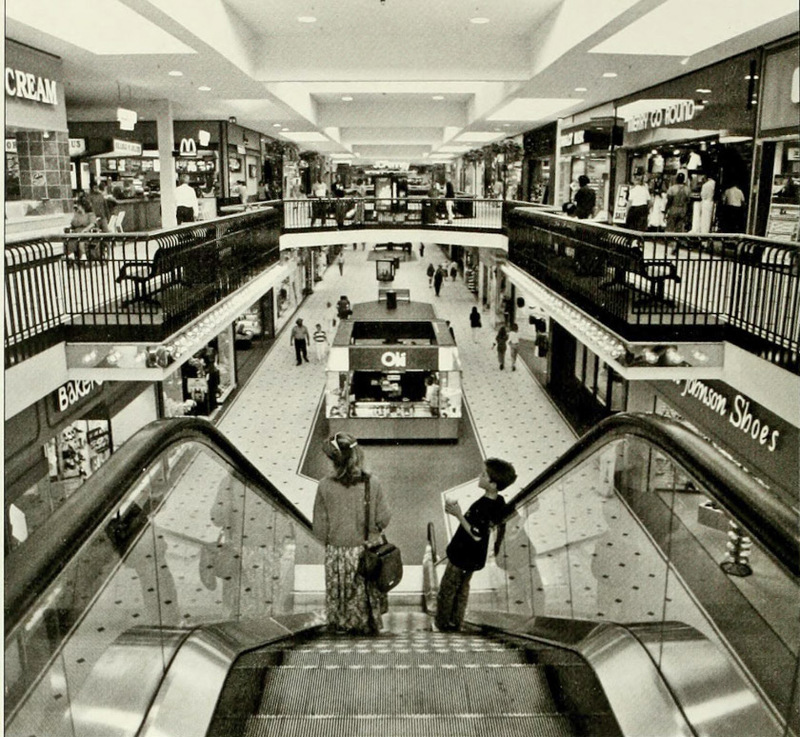 South Square was a two level enclosed mall, Durham's first, that opened in 1974. Northgate Shopping Center quickly moved to compete with South Square (and the broader new trend of enclosed malls that would quickly eclipse strip shopping centers as centers for department stores and higher end retail.) The mall had ~100 stores when it opened, anchored by JC Penney, Belk-Leggett, and Montgomery Ward. It also had a movie theater on the southern side of the building, and a food court on the upper level. Montgomery Ward closed in the early '80s and was replaced by Ivey's. I was one of those folks that opposed the rezoning of land for Southpoint. I don't know that I was wrong about that, and I don't know that I was right. Part of what I was concerned about has happened - the de facto urban growth boundary that I-40 represented was breached entirely. I said, thinking I was being a bit hyperbolic at the time, that in 10 years, we'd have big development on the shores of Jordan Lake. South Square's owners insisted they would be fine if Southpoint was approved. It was shocking how quickly the mall closed when Southpoint opened. Everyone thought they would suffer, and we'd eventually displace all of that growth down into the rural area south of I-40. I'm not sure anyone thought South Square would empty and close in a couple of months. Belk had become Hudson Belk, and JC Penney and Dillards were anchors as well when southpoint opened in Spring 2002. Penney's and Belk closed immediately - Dillard's seemed like the last place with the lights on when they finally gave up in August 2002. There was some discussion about what to do with the mall - I believe Durham Area Designers got its start in creating a charrette to propose creative solutions for the site that would create some beauty in - to borrow the lingo of my forerunners "this section." 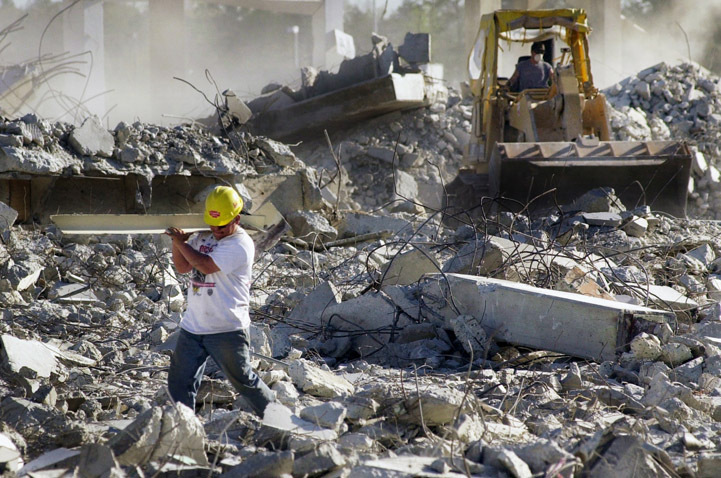 8 months later, the whole mall came down - an amazing amount of material was wrecked and hauled off - to where, I don't know. I never was a fan of South Square's architecture, or just the mallscape in general. But I didn't really imagine that the site could become so much uglier. This area used to be a significant retail hotbed - it really seems moribund at this point. Target et al do a brisk business, of course, but it seems like most things around it have struggled since South Square died - the nicer stores have decamped to South Durham, and it's kind of an odd mix of independent establishments and struggling downmarket chains in this area. I hope the University Marketplace project can get out the ground - everything between Academy and Garrett could use a major reboot that includes some walkability and human-scale development. to John Martin . .